Want to catch a striped bass on a deep-diving crankbait? December is a great month, because fish will be shallow, often schooling with largemouths. I have always enjoyed fishing in December, in part because so many fishermen are in deer stands that the lake can seem like it’s almost deserted. I can remember fishing a lot in November and December when there was very little fishing pressure on a lake. I had some of my best days ever fishing at Buggs Island in December. 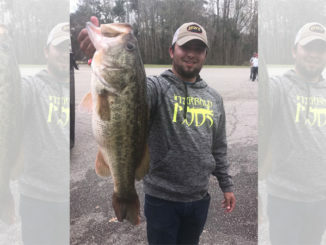 One of the things that makes December a great month to fish is that, on lakes that have both largemouth bass and striped bass, you can often catch them together, and both species will often be up in relatively shallow water. Of course, this depends on the weather, how the season is going. 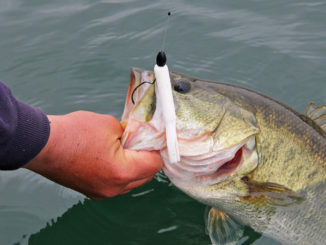 Until it gets really cold and the fish move to deep water, you can catch them on the same places on the same lures. 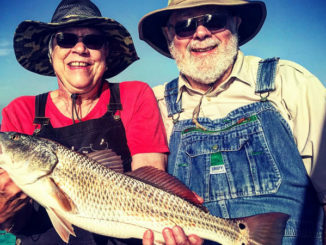 Get in the right place and you can make a cast and not know what’s going to bite — but when they bite, you sure know what you’ve got right away. This month, two basic patterns are going to work. There will be a lot of fish shallow, back in the creeks, that haven’t come out because the baitfish are back there. They’ll be relatively shallow, 10 to 15 feet deep. 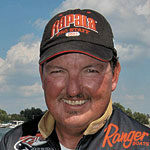 I can remember way back in the day, when the deepest-running crankbaits we had were a Bagley DB-3 and Model 8A Bomber. They would run down to about 15 feet, and we could catch stripers and bass on them. But now, baits have changed, everything has changed. When you find them back in creeks, a lot of the time, it will be on up in the day before they come up good. You want to be fishing channel banks, too, places where you can sit in 10 feet of water and throw to the bank. If you’re sitting in five feet and making a long cast to the bank, that’s not the deal. The other thing you’re going to be looking for will be long points, long flats, road beds — anything that extrudes extra-far out into the lake. If you find bait on them, you’ll find schools of bass and stripers. 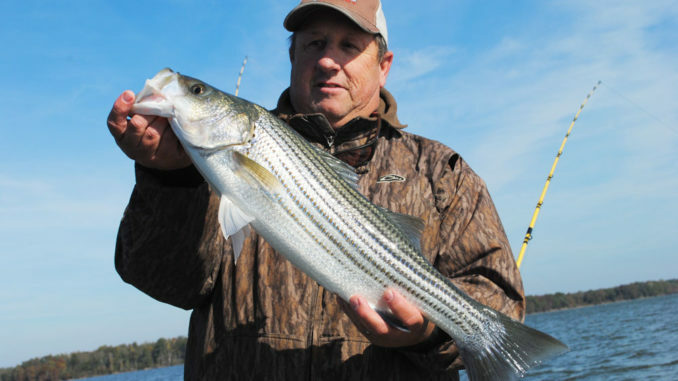 At this time of year, bass and stripers both like hardbottoms, any areas with rocks or riprap or shale. Anything rocky is better than not. Rocks hold heat a little better than other kinds of bank, and that draws baitfish and bass. The deeper the water is, the less heat they hold; that’s why you’ll find fish up shallow, and that’s why roadbeds are so good in December, because you’ve got an extremely hard bottom and shallow water next to deep. When I’m fishing these kinds of places, I like baits that are a little on the bigger side, but not great big. I like to stick with 3-inch baits like a 17.5 or 20.5 Dredger. I’ll fish them on one of my Lew’s David Fritts Perfect Crankbait rods, a 71/2-foot model, medium heavy, with a BB-1 reel. I like to fish crankbaits on Berkley X9 Crystal braid in 10-pound diameter. That’s plenty big enough for stripers, because the 10-pound diameter is equal to 30-pound test. If you opt for monofilament, I’d fish 10-pound test. One thing you don’t need to forget is your heavy metal. I always have a jigging spoon tied on when I’m in an area where I think I’ve got a chance to tangle with a striper. You can fish them deeper than crankbaits if you need to, or you can just offer them out there as an opportunity. I like to fish a Hopkins 150 Shorty. I don’t think it matters whether or not there’s a feather tied in on the hook. I’ll fish the spoon on the same tackle. The only difference is, if I’m using monofilament, I’ll have 20-pound test spooled on my reel. If the weather stays nice, you can catch bass and stripers together all the way through the month. Real cold weather will be them down. While they’re up, take advantage of the opportunity.